New photo added February 6, 2016. All new photos are at the page bottom. NOTHING ON THIS PAGE IS FOR SALE! 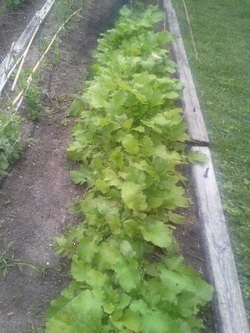 OUR BUNNIES LOVE TURNIP GREENS, TOTALLY ORGANIC. 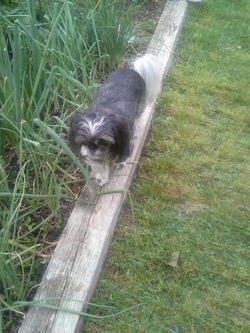 GARDEN GUARD, MAKING SURE NOTHING EATS THE VEGGIES BUT THE BUNNIES AND US. 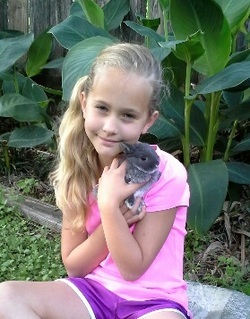 PROFESSIONAL BUNNY TAMER AND TRAINER. 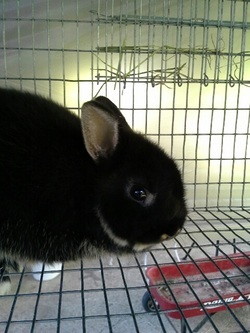 THIS BUNNY IS "DOMINO" WHEN SHE WAS A BABY. SEE, I CAN SIT UP AND SHOW YOU MY PRETTY TUMMY COLOR. 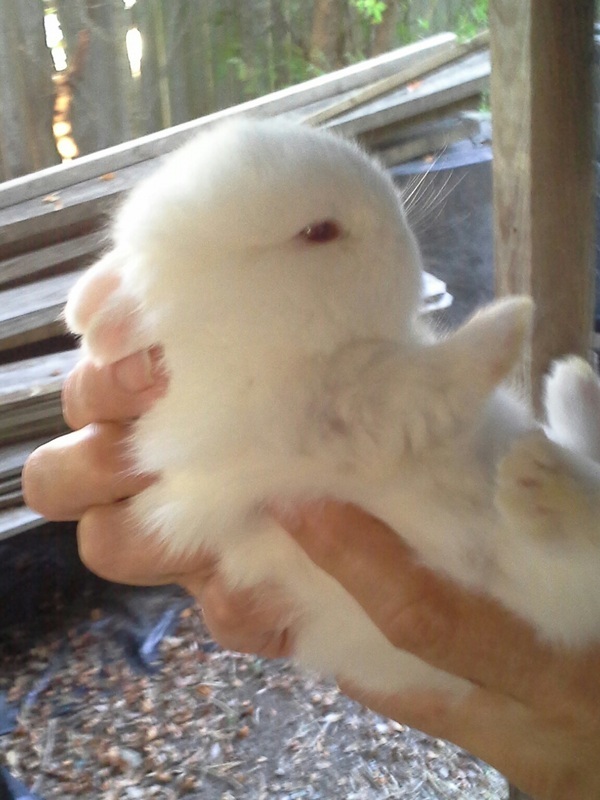 THIS IS ONE OF MY MAMA RABBITS NAMED STARLIGHT. ISN'T SHE THE CUTEST LITTLE THING! SHE IS A BLACK OTTER AND ONLY WEIGHS 1.83lb. HER MARKINGS ARE VERY GOOD. NOTHING ON THIS PAGE IS FOR SALE!!!! 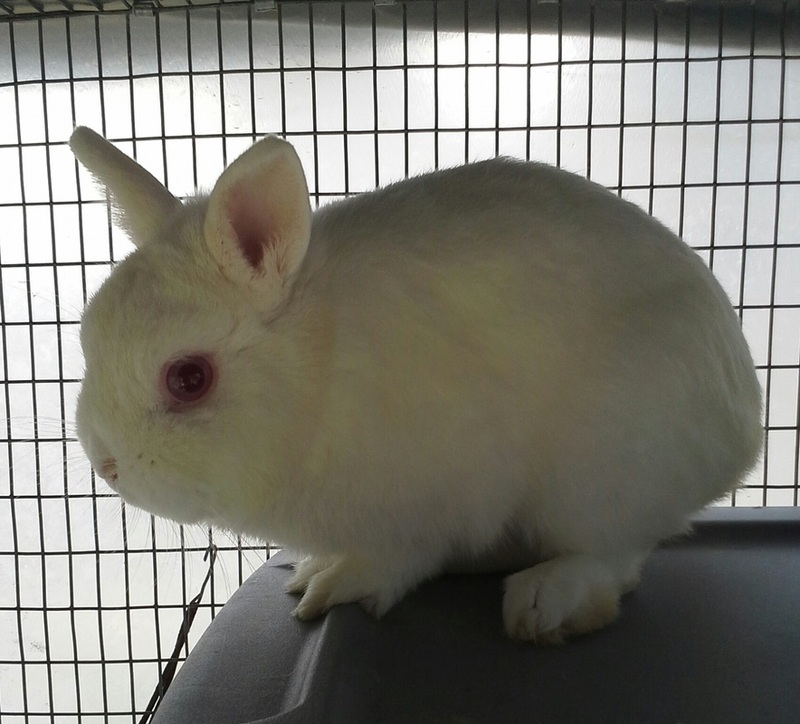 CLEAN SPACIOUS CAGES MAKE HEALTHY, HAPPY RABBITS. 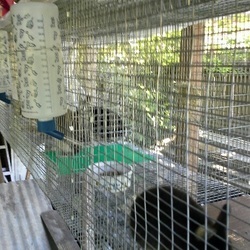 (THE GREEN & BROWN MESH MATS ARE ON THE FLOOR TO PREVENT SORE FEET/HOCKS FROM THE WIRE CAGE FLOORS. 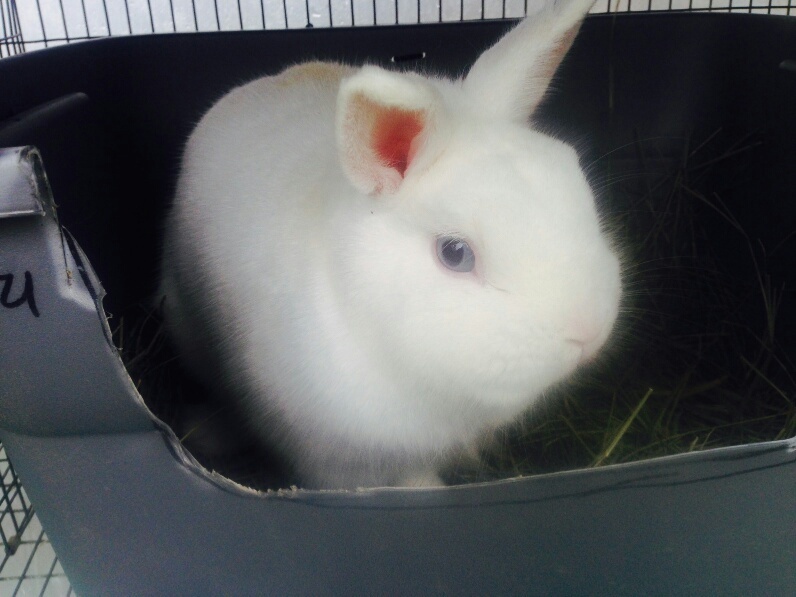 MY BUNNIES DO NOT LIVE IN AIR CONDITIONING, THEY ARE USED TO THE OUTDOORS. 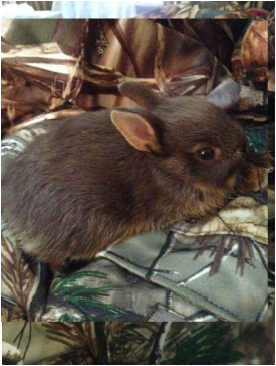 CHARLES BRONSON, "CHARLIE" IS ONE OF THE HERD BUCKS THAT MY BABY BUNNIES COME FROM. 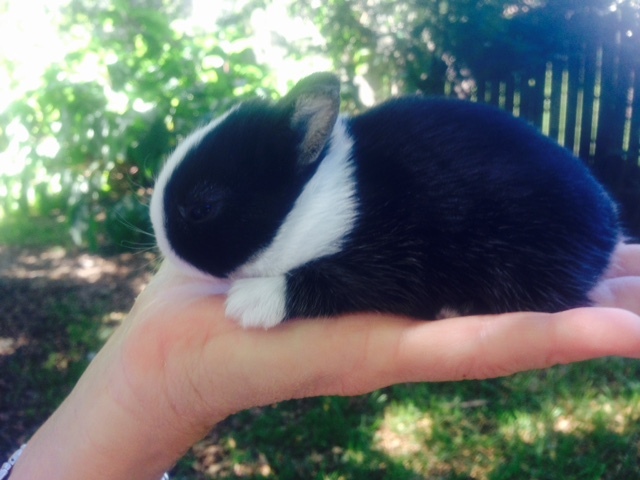 HE IS VERY TINY, ONLY ABOUT A POUND AND A HALF. CHARLIE WAS BORN IN EAST TEXAS AND CAME HERE VIA HITCHCOCK EARLIER THIS YEAR. HE IS A REAL LITTLE ROMEO. 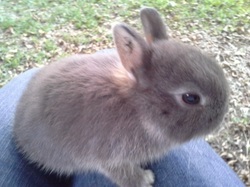 Let me introduce you to one of my Papa rabbits. 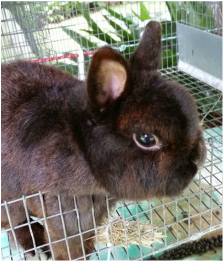 His name is Mocha and he is my chocolate bunny!!! 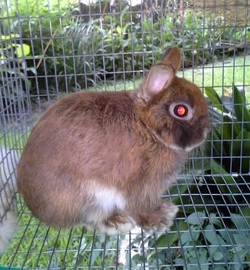 He is molting right now, so all the rust colored fur will change to chocolate brown in a few weeks. 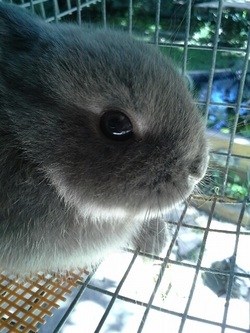 He is very small and sweet. 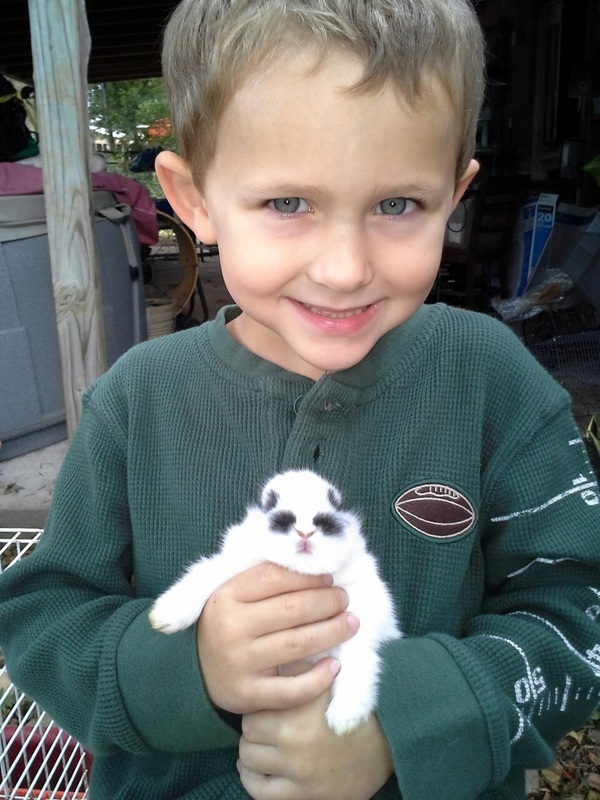 He has big brown eyes and chipmunk cheeks. He comes to the door of his pen every morning to flirt with me. Especially if I have a treat for him. He is called a "Chocolate Otter" because of the lighter tummy and various other lighter areas in his fur. He has the cutest little wiggly nose. My phone camera made his eyes look red, they are really brown and beautiful. He came from Louisiana to live with me. 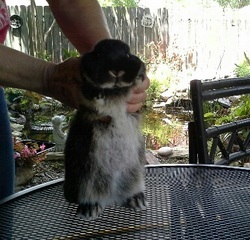 Another of my mama bunnies. Her name is "Checkers" but I just call her "Check". She likes to sit on my lap, be petted and have the place behind her ears rubbed. Her color is "Broken Blue". She loves to eat uncooked oatmeal before she goes to bed. Bratnella jumped out of the nest this morning and her eyes are opening. 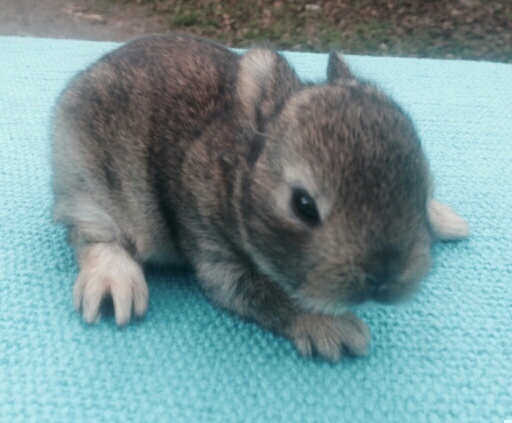 12 days old! Domino has such pretty spots, that you just had to see her from the side. Now you know why her name is Domino. She is such good girl, she craves attention and comes to her door when I say "Good Morning bunny bun-buns!" 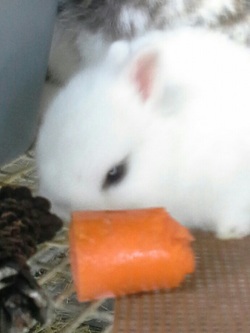 She loves all the typical bunny things like carrots, hay and her bunny food. She likes to lick water melon chunks and will sometimes eat them! 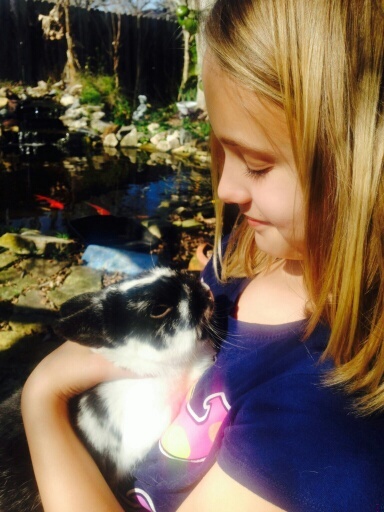 Maybe she will have some bunnies for Easter. Her mother is Abby. 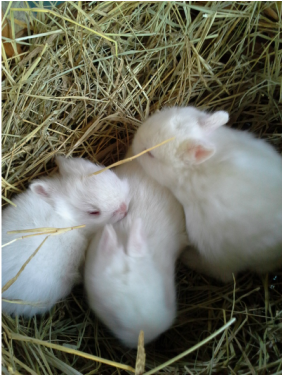 These three little darlings were born on August 1, 2013. 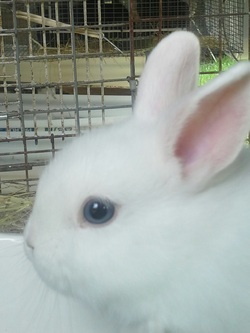 Their color is called Ruby Eyed White or REW for short. 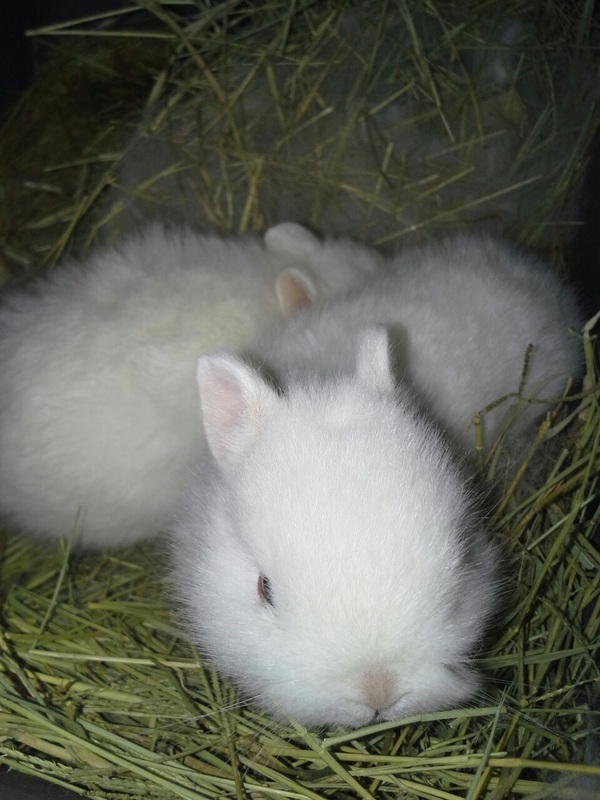 In this photo they are 16 days old. 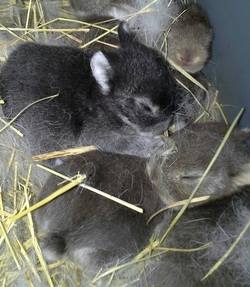 They are trying to crawl around the nest, but can't hop very good yet. 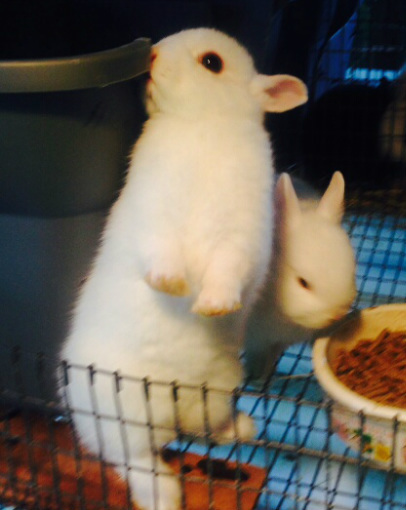 They jump up and down when Starlight comes in to feed them. 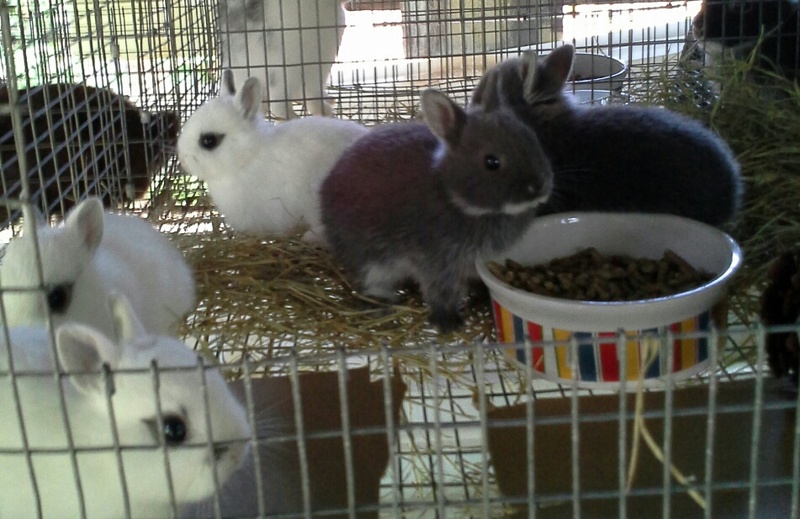 They will stay here at Sugar Bunny Rabbitry until they are 8 weeks old. Their mother is Bella's sister and looks just like her. Bella's photo is at the top of this page. (All three are spoken for. If you fill out the email form, I will put you on my waiting list.) Below: One of Starlight's babies. 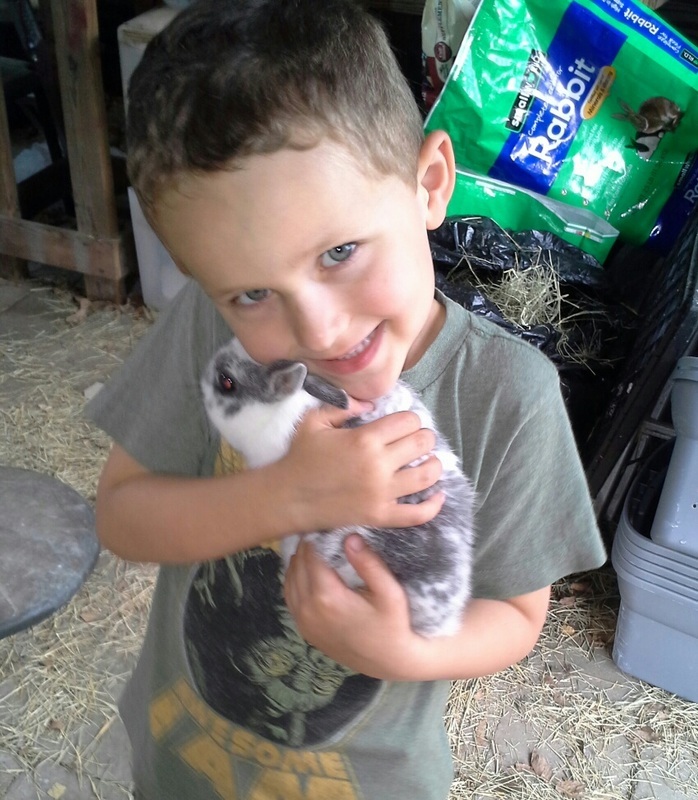 This is the boy bunny, my grandson named him "Johnny". 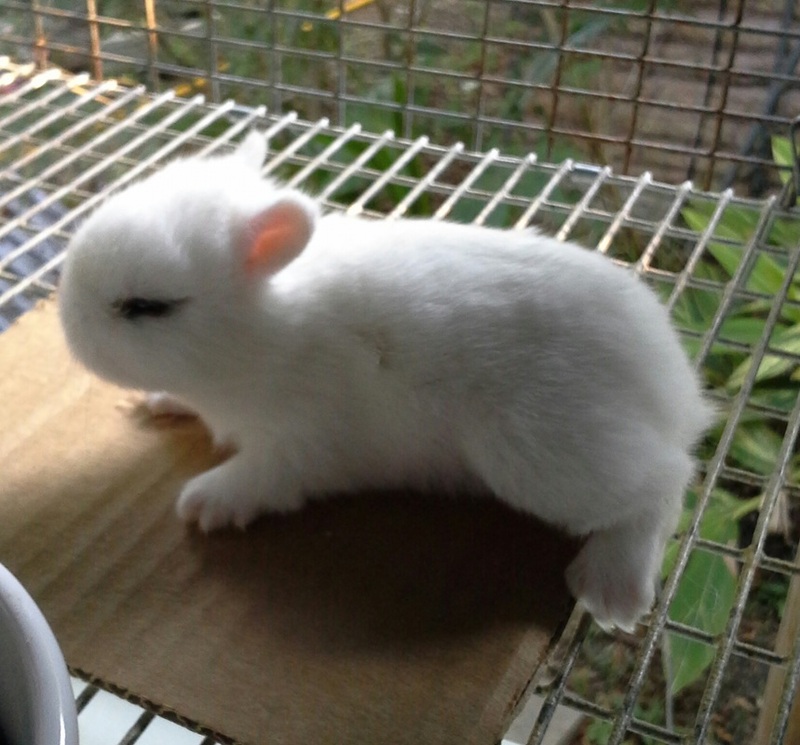 3 weeks old. 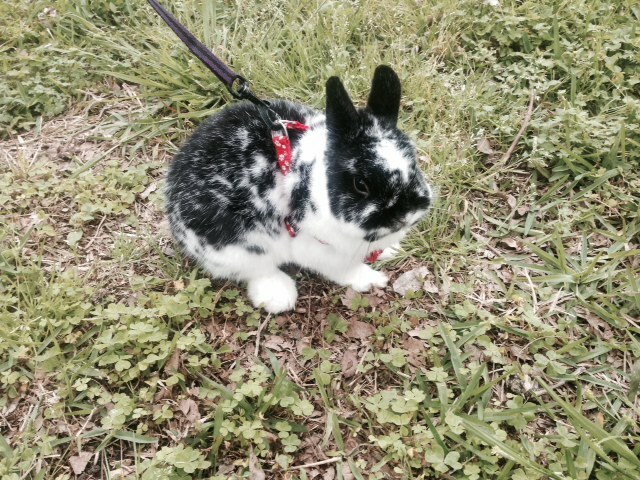 Look at this beautifully spotted Mama rabbit. Her name is Abby and she came from Ohio to live with me. She is a wonderful mama and her babies are just as pretty as she is. Abby is sort of a lazy girl. She lays around a lot and watches what goes on out of one eye. 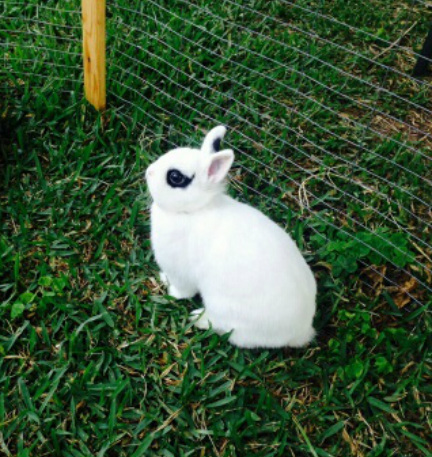 She is a spy rabbit. If she spies food, she jumps right on it! She loves to be scratched behind her ears and down her back. She stretches her full length to let me see the beautiful pattern of spots running down her back. She looks like a domino in motion. Her color is called "Broken Black". 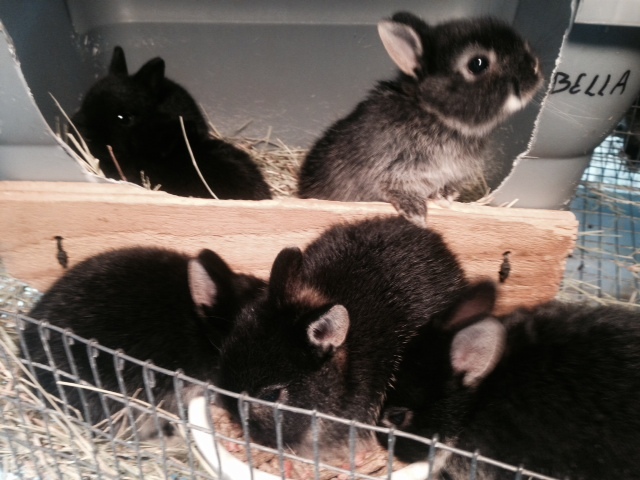 Her little black bunny babies were born July-15-2013 and 10 days old in this photo. Their little eyes are just starting to open. (Sorry, they are both spoken for.) Another photo below this one. 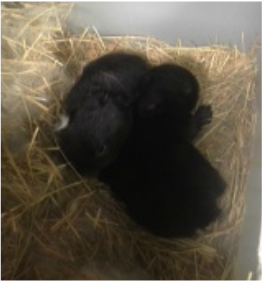 Below- Two black babies only 2 and a half weeks old. 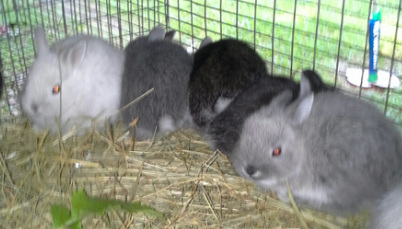 They are scampering around driving mama rabbit crazy. Sparkles & Jazzmine. NOTHING ON THIS PAGE IS FOR SALE!! They call me Big Foot! This carrot is bigger than me! 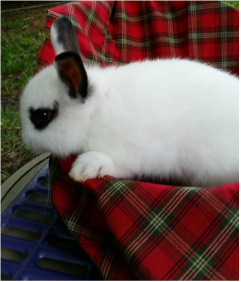 "Bratnella"
Anthony "Tony" One of my Papa bunnies. 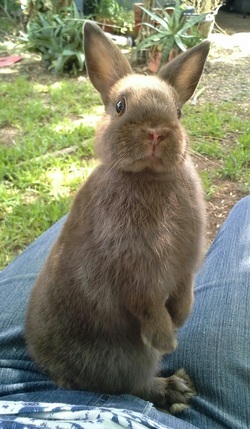 Tony is my favorite rabbit. This photo doesn't do him justice. His color is Broken Black Blanket Pattern. The black color is deep and rich and soft as a feather. The white shines like snow. 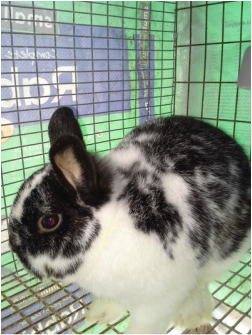 His mother is Abby and his sisters are Domino and Little Spotty. 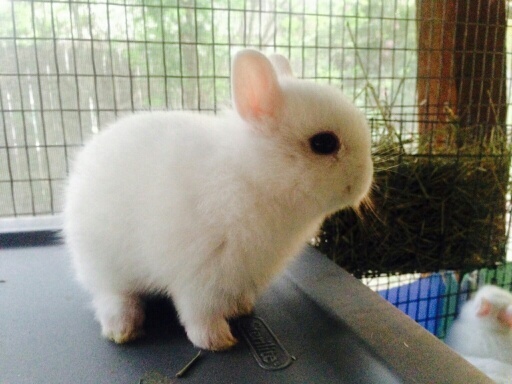 I do not have this color of bunny for sale very often. 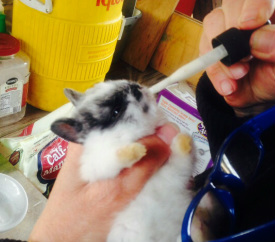 Tony Jr. being fed with an eyedropper. 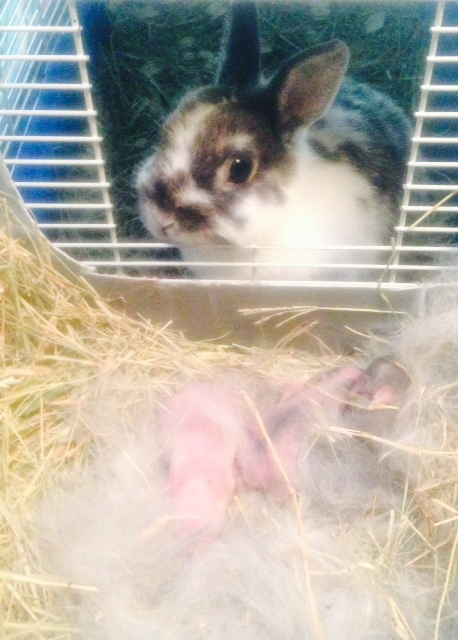 Below: 3-24-14- My very first Blue Eyed White Babies. Mama is Stoney and papa is Blue Boy. They just got their eyes open. Nothing on this page is for sale. All sold or ours. ﻿Bayou in his nest box. No lid because Bayou is messy. 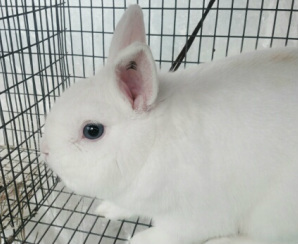 He is a Blue Eyed White. 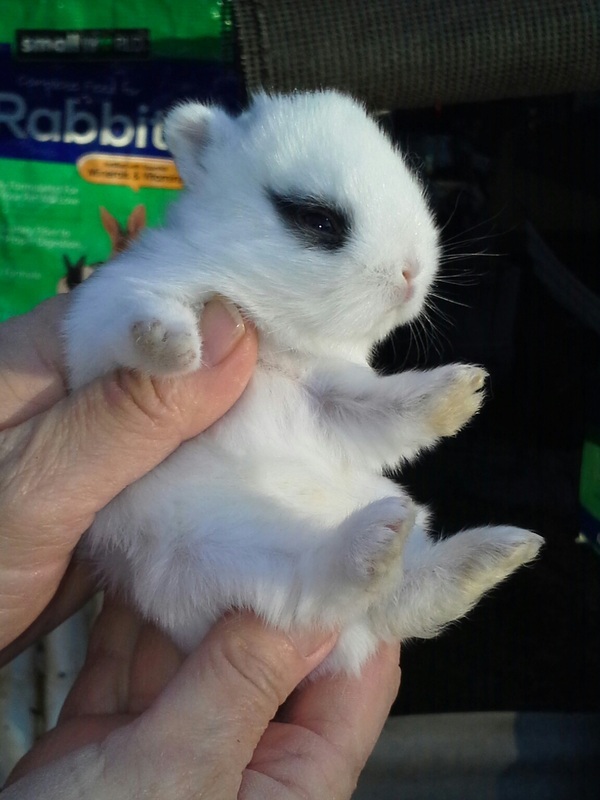 Beautiful bunny! baby. 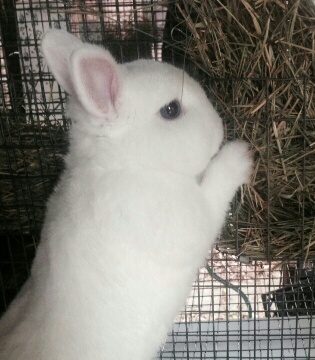 He loves holding the bunnies. Joanie & Sissy. Blue Eyed White twin sisters. 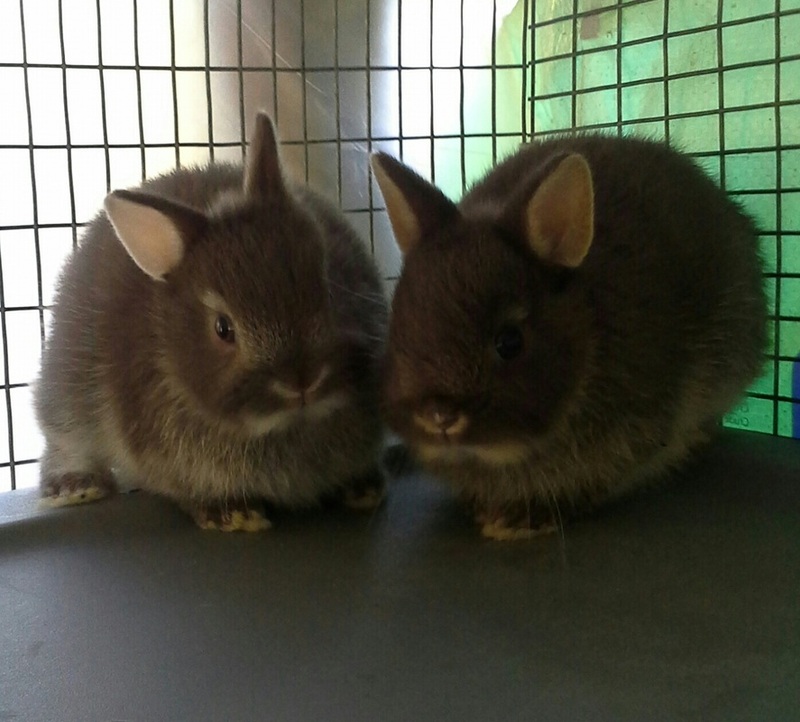 They are about 8 weeks old. The flash makes their eyes look black. ﻿Sleeping Beauty-12 day old BEW baby. I took 4 flash photos, never woke up﻿. Emma and Tex and below this, Tex by himself. 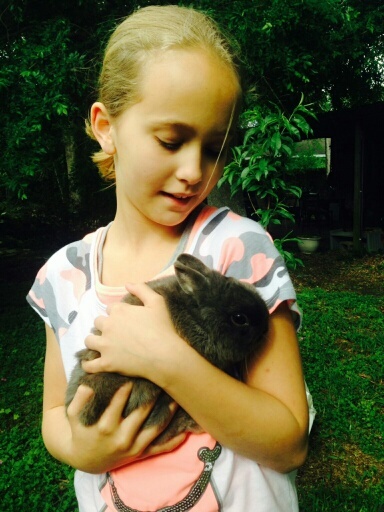 Emma's pet rabbit is full grown and weighs 1.9 lbs.April 16, 2014 and is called Blue Self color. 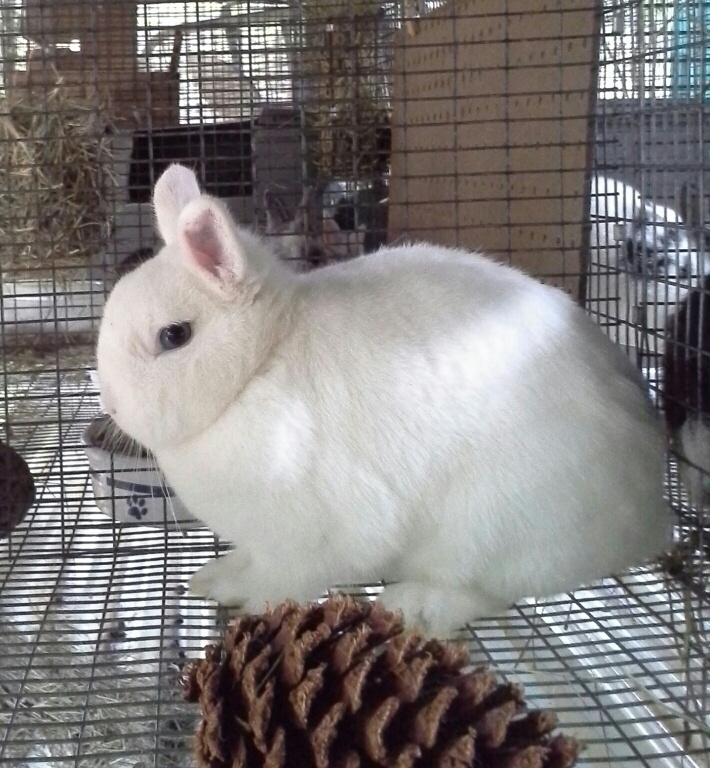 ﻿Bunny Exercise Pen. 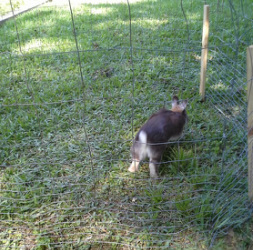 We built an exercise pen for the bunnies from some old wire that we had left from some other project. 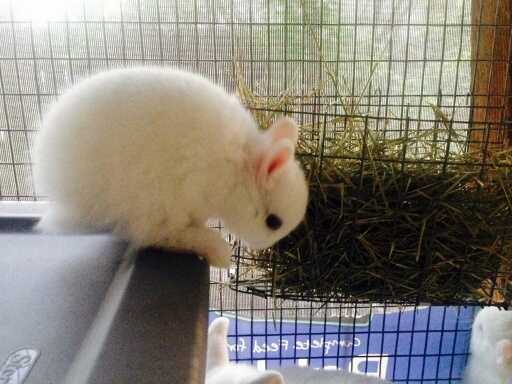 We used stakes to hold it open and to keep it from tipping over when the bunnies leaned on it. It is about 5 feet in diameter and 3 feet high. Our big tree shades it most of the day. They seem to love it. They jump and play and generally act foolish. The most important things are shade and safety. 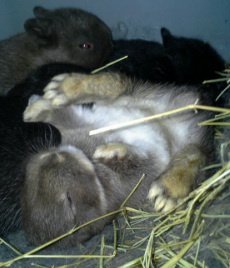 Two of the smaller bunnies went under the wire and into the flowerbed while I wasn't looking. 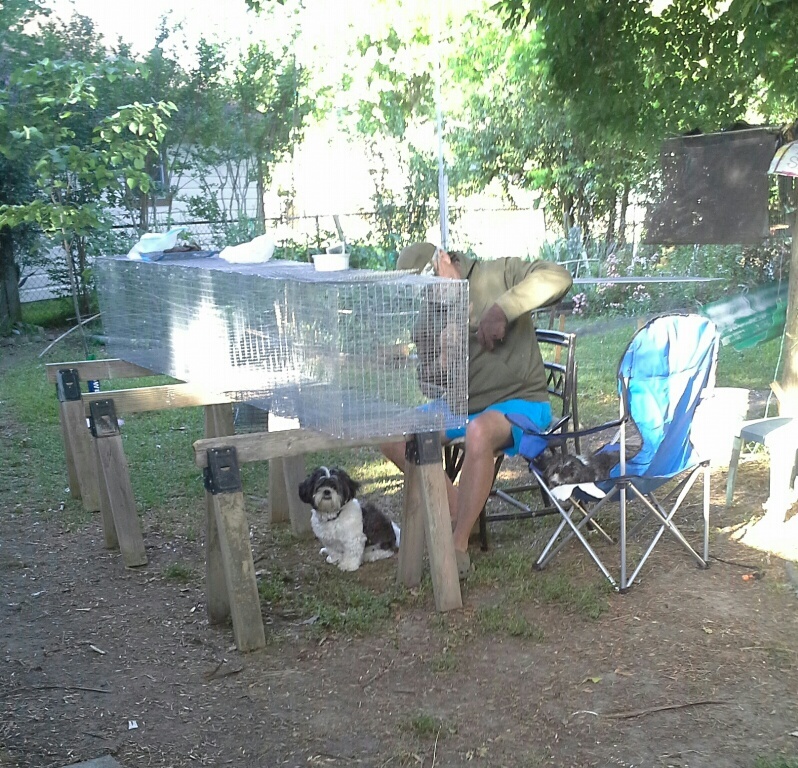 Sugar Baby, my Shih Tzu, saw them and started to raise a ruckus. I put her on a leash and she led me right to them, and then she wanted to bite them! 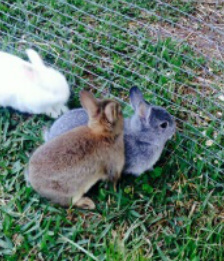 I can't trust any of my dogs around bunnies. Top row from the left- Abby, sitting up, posing for the camera. 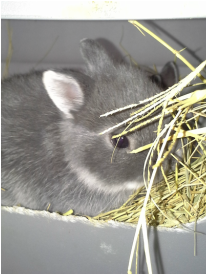 The grey tub has a hole in the other side so the bunnies can get under it if they get scared. 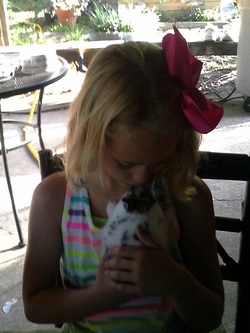 Of all the bunnies, I think Abby enjoyed the play time the most. 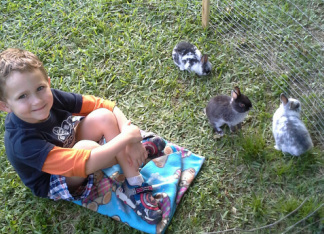 Evan and his bunny friends. 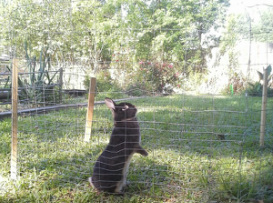 Gayla standing on her hind legs looking at the sky for hawks. (There were several flying around just looking for a meal. 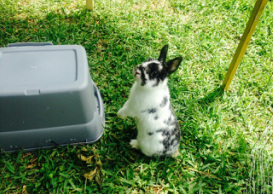 Don't leave your bunny unattended!) Bottom row, from the left. Lovey kicking her heels up. 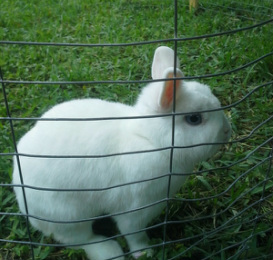 Jujube sitting and enjoying the grass and cool breeze. 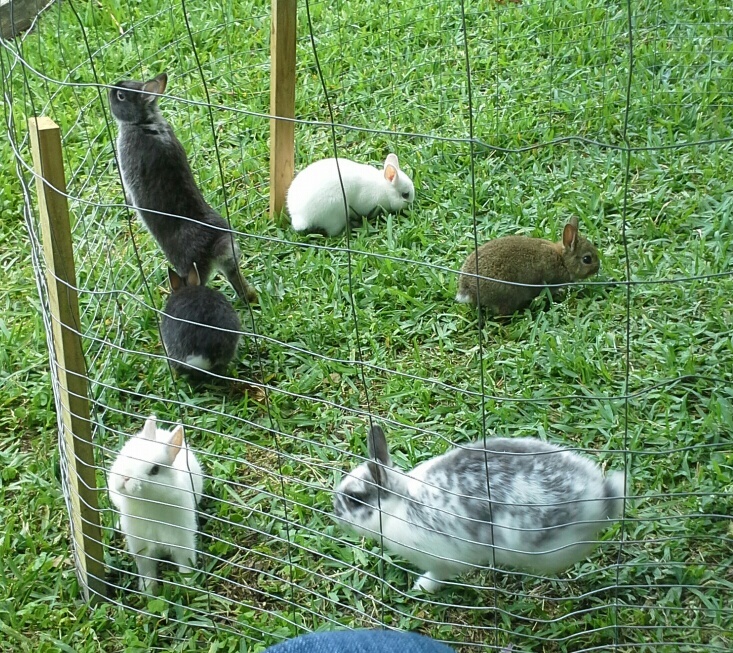 A bunch of girl bunnies that were having a good time, at first. Then Joanie, the white one closest to the camera, started to pick on everyone and the fight was on. 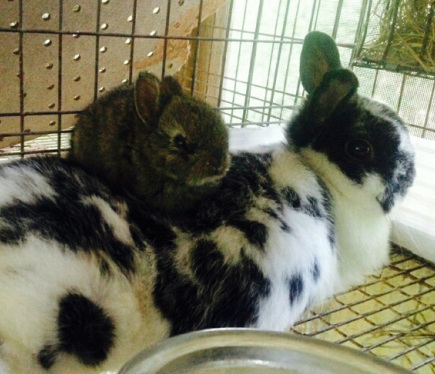 They jumped and scratched and bit and hopped over each other. I had to take Joanie out so the others could enjoy themselves. I did not know Joanie was a trouble maker. She seems so sweet. Good looks and blue eyes can be deceiving. April 21, 2014 ﻿WARNING!! 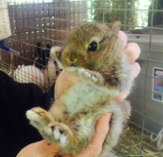 5-1-14 Today we had some young bunnies jumping and playing in the bunny exercise pen. We we standing under the tree watching them act silly. All of a sudden a Hawk came swooping down to try and catch one of them for lunch. When he saw us he did an abrupt turn about and flew away as fast as he could. 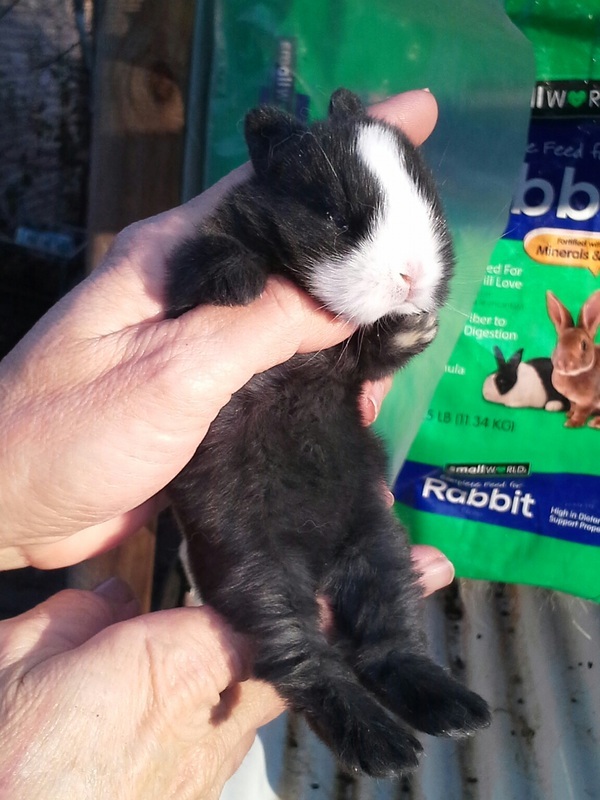 If we had not been there one of our bunny babies would have been lost. 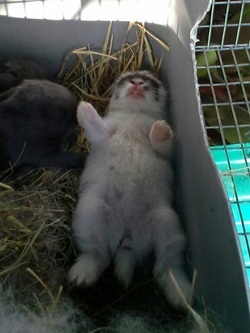 DO NOT LEAVE YOUR BUNNY UNATTENDED FOR ANY REASON. 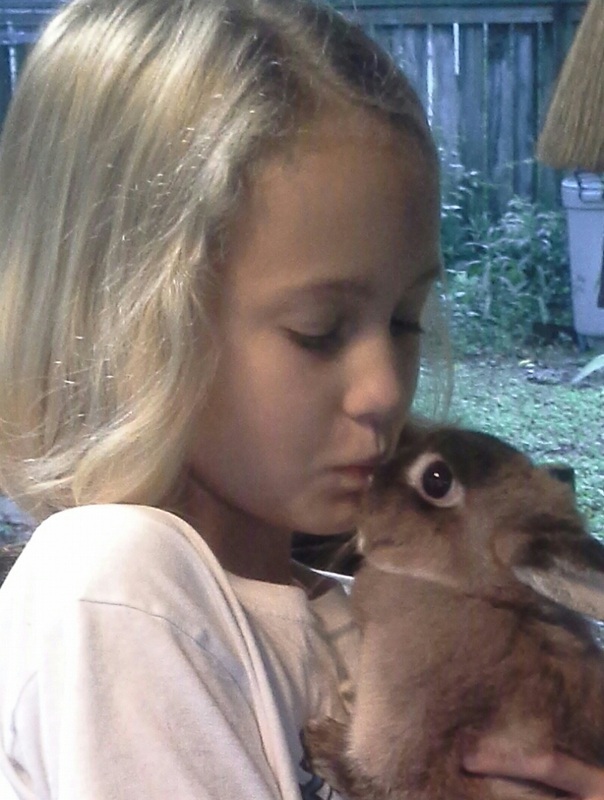 If you have to go inside, take the bunny with you. This Hawk now thinks he knows where to get a free lunch, he will be keeping an eye on our bunny pen. We will be keeping an eye out for him. 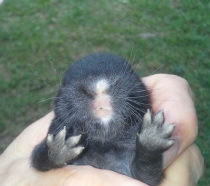 Gayla had Solid Chocolate, Chocolate Silver Martin, Black Otters and this Jet Black baby with a white nose. It is only about 4 days old in this photo. 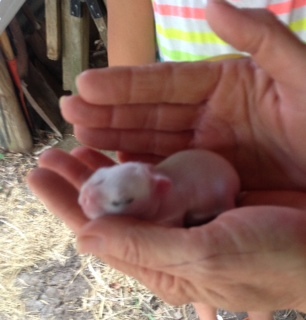 I will take another one when it's bigger and it's eyes open. ﻿Working hard, building a new cage. Eddie Cruiser is guarding things. Sugar Baby is asleep in the blue chair. 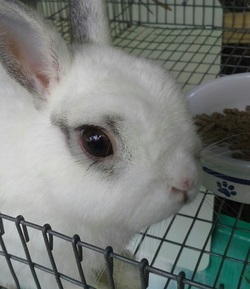 This beauty is Revlon, my baby bunny with eyeliner. She is Mabelline's little sister. She has so many color names you can get confused. 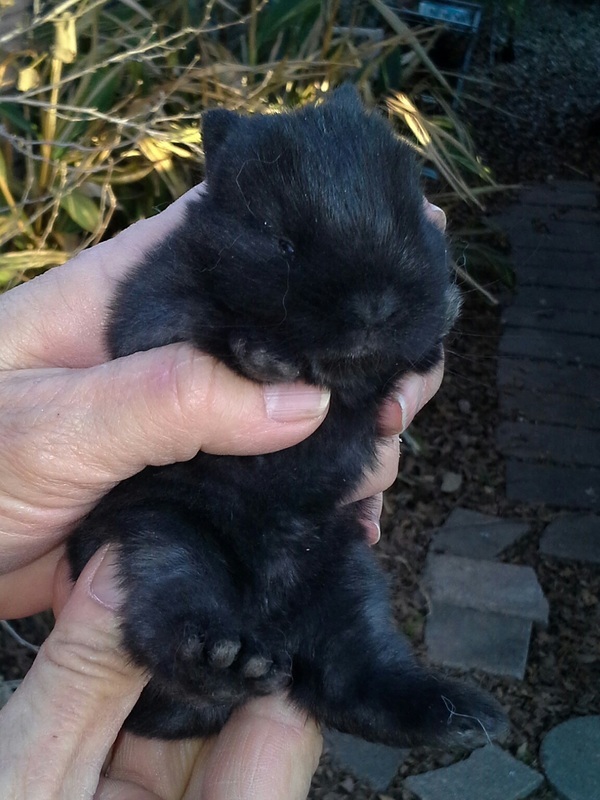 She is a "Broken Black, Charlie Marked, Netherland Dwarf." 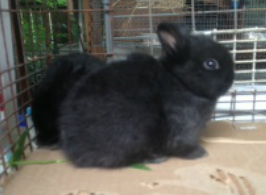 Her papa is "Alvin" (Black Self) Her mama is "Abby" a "Broken Black Blanket Pattern". She can have Jet Black, Charlie Marked (like her) or spotted babies. Isn't that cool? She will be old enough to have babies this summer. 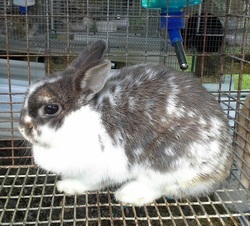 Watch the "bunnies for sale" page for any announcements. 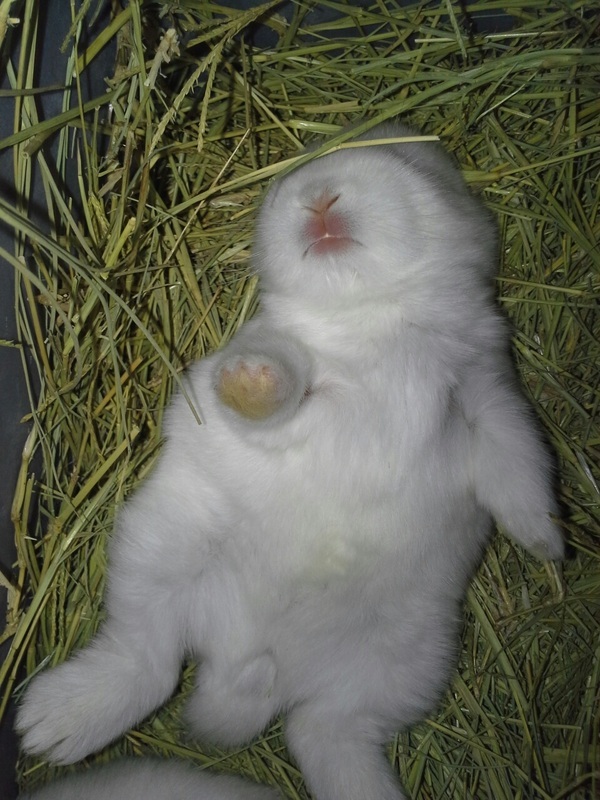 Just snoozing away. All the other babies woke up to the flash, but not this little guy. Nothing was going to disturb it's nap. 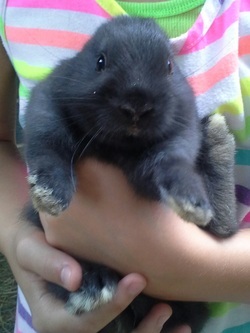 This is one of Gayla's Chocolate Silver Martin babies. May 17, 2014 Netherland. WHAT A CUTIE! NAME IS "BOSTON"